The clarinet is a member of the woodwind family. Sound is produced by a vibrating single reed which is the same sound producing method as the saxophone. Other similarities to the saxophone make the clarinet a good starting instrument for students who may want to move to the saxophone later on. As with all instruments, the clarinet does require maintenance and cleaning. It comes in four pieces plus a reed and a ligature. The ligature is the clamp that hold the reed in place around the mouthpiece. The reed is the most delicate portion of the instrument. Its very easy to chip a reed by bumping it against a music stand or clothing. Once a reed is damaged or worn out, it needs to be replaced. Even students who are very careful with their reeds will still need several replacements to get them through a year of band. All reeds are given a rating of strength, 1 through 5. The lower the number the softer the reed. In general, the stronger or stiffer reeds are used by advanced players. Teachers have different opinions on the best reed strength for beginners. The most commonly held belief is that beginners should start with a number 2 reed. A number 1 is too soft. Players advance to higher numbers as their performance level and lip muscles develop. The clarinet is played with the left hand closest to the mouth. The right hand covers the lower keys. The clarinet is the only beginning woodwind instrument where some of the keys do not cover the entire hole. This means the player must cover some of the keys with the pad of his/her fingers in order to prevent air from leaking out. This isnt difficult to master but air leaking out of a key is a common cause of the typical beginner squeak. As with other instruments, there are several types of clarinets. The basic clarinet is small and easiest to play for young students. Beginning clarinets are made of plastic and professional clarinets are made of wood. Other sizes of clarinets include an Eb (E flat) clarinet which is smaller than the standard Bb clarinet. 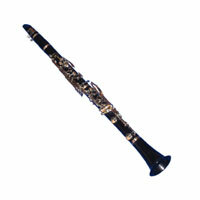 The Eb clarinet is not typically used as a beginning instrument. Its difficult to control and constructed with the advanced player in mind. Other larger clarinets include the alto and bass clarinets. These are longer, curved instruments similar to the shape of a saxophone. Some beginners have done quite well on these instruments but generally the basic Bb clarinet is preferred for beginners. Two other clarinets are used by high school and more advanced players. The contra-alto and contra-bass clarinets are extremely long and very low. A band or symphony orchestra may use one of these instruments now and then but their use is very limited. Since all of these clarinets are similar, a good advanced clarinetist can switch to any of these instruments as needed for performances. The clarinet is a very popular instrument for beginners. Since lots of other students will choose the clarinet, there will be more competition with other players. However, the clarinet is a very widely used instrument. Clarinets play a critical role in bands, symphony orchestras, jazz groups and small instrumental groups. The styles that characterize the clarinet vary from a Mozart clarinet concerto to Dixieland clarinet. In both cases, the sound can be beautiful but the two styles sound completely different. The clarinet also works well as a solo instrument. There are lots of choices for purchasing a clarinet. They are relatively easy to find as a new or used instrument. Giardinelli sells a very popular beginning clarinet, a Vito model 7242. Vito is one of the very good brands of beginning clarinets. Purchasing a used clarinet can be a good option if it is purchased with caution. Older clarinets or clarinets that have not been well maintained can be out of adjustment or in need of repair. The pads under some of the keys are very delicate. They may need replacing from a qualified band instrument repair shop which can get expensive. Buying a used instrument is only recommended if you know an advanced clarinetist or band director who can test a used instrument before you buy.